Saul Turteltaub, who is perhaps best-known for producing such popular television shows as “Sanford and Son” and “Kate and Allie,” is also the author of a warm, affecting, funny, and as-yet-unpublished memoir of Cong. Ahavath Torah. Called “The Old Shul,” it is a treasure house of nostalgia and wry and poignant insights about his family and community. The Old Shul as it looked in the early part of the 20th century. The “Old Shul” of Turteltaub’s manuscript is not the mansion on Broad Street that has been demolished to make way for the new Ahavath Torah, but a building on Englewood Avenue between Armory Street and Bennett Road. 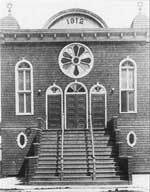 And according to Rabbi Shmuel Goldin, the congregation’s current religious leader, there was a still-older shul, built during the summer of 1895 at 33 Humphrey St. in Englewood. “Before that they davened in a home on Liberty Road,” Goldin said in a telephone interview on Monday. “The Humphrey Street lot was bought as a result of a campaign that collected $200.” After 15 years, the congregation moved to the Englewood Avenue site, the “Old Shul” of Turteltaub’s memoir. Years later, long after his sons Adam and Jon were bar mitzvahed, he still had the bottle of slivovitz on his shelf, with perhaps a drop in it. Bernstein soon left to attend medical school, and Turteltaub stresses that “there was never any suspicion of hanky panky” during his tenure. Gold was followed by Rabbi Nussenbaum and then by Rabbi Benjamin Walfish – who officiated at the wedding of Saul and Shirley Turteltaub – and then by Rabbi Isaac Swift.